To celebrate the upcoming DVD release of Bound By Blood, starring Jessica Biel and Zosia Mamet we’ve got 3 DVDs to giveaway! Radiant yoga instructor MAY (Jessica Biel) has her wholesome life thrown out of balance by the arrival of her long-lost biological sister SHIVA (Zosia Mamet of the hit HBO show GIRLS), a street-smart yet naïve young woman with an abusive boyfriend. May feels compelled to rescue the hapless Shiva and finds herself increasingly drawn out of her sedate world and deeper into Shiva’s chaotic one – with lethal consequences. For a chance to win a DVD just enter via our competition app below! The competition ends at 23:59 on 22 April 2016. 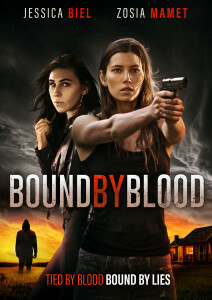 The prize consists of a Bound By Blood DVD. Win Amazing Miles Davis Vinyl Bundle Collection! Competition: Win The Rewrite Starring Hugh Grand on DVD!